Cleverly Engineered Minimalist Chess Set | OhGizmo! It’s apparently been around since 1966 and is an official part of MoMA’s collection, but this modern minimalist chess set is new to me and I think it’s absolutely brilliant. The size of each piece represents its significance on the board and their individual designs reflect their range of mobility. The knights are ‘L’ shaped and the bishops feature a diagonal slope. And if that wasn’t enough to earn it some praise, the fact that all the parts assemble into a compact box like a puzzle certainly will. 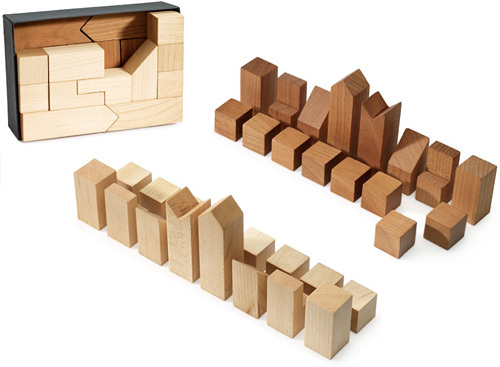 The pieces are made from maple or cherry wood to distinguish each side, and the whole set (minus board) is available from the MoMA store for $65. I wouldn't be able to tell most of these apart. dude, this is an uber cool chess set. its both a clever little puzzle and and an efficient design, i love it!